We cover the whole syllabus in fix time but also give extra classes for students. Best coaching for SSC. Best Daily Test Series On Examination Level. Best SSC Coaching, SSC Coaching in Jaipur. We charge very nominal fees for preparation of SSC, Bank & Railway. We provide A.C. classrooms and well-equipped 24*7hour library facilities. We provide current updated test series prepared by our SSC Bank Railway experts&teachers and also provide qualitative study material. We provide top 10 tips to clear SSC & Bank exams. Every Institute’s Foundation depends on its vision and mission. If vision is strong then only one can achieve the target. One’s Vision decides the mission and mission decides the work-efforts. Our Vision and Mission speak all about us. Here, you get the best faculty team which guide you at the best level. MISSION: - By providing the best team of faculties who are extreme experts in their fields and best support staffs who always take care of each student.Best SSC Bank Railway Coaching in Jaipur. VISION: - To become Best Destination for Best SSC, SSC –CGL, SSC –CPO, SSC-CHSL, Bank, BANK PO, BANK Clerk, & Railway ALP(Assistant Loco Pilot) Preparation Institute and we are achieving it. Work hard to get the best result. Best SSC Coaching, SSC Coaching in Jaipur. 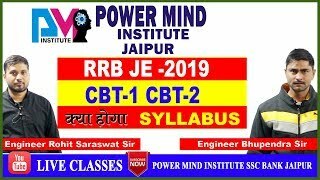 Every Student of Power Mind Institute-Best SSC Bank Railway Coaching in Jaipur will be a success story. Just need to do hard work and be focused on career. OUR APPROACH: - How we achieve it. To Pursue excellence and shall follow this for all time. We aspire to install the right attitude, value and vision that will prepare the student to continue learning and leadership in their chosen careers for a lifetime. Best SSC Coaching, SSC Coaching in Jaipur. OUR SYSTEM:-Orientation session is our first introduction to parents and students. The session aims to brief the parents about POWER MIND INSTITUTE as a system, as a community, as a family, as an ultimate place where dreams are turned into reality. Best SSC Coaching, SSC Coaching in Jaipur. On the Basis of our vision, mission, and efforts, Power Mind Institute is going to be India’s Best SSC Bank Railway Coaching in Jaipur. We nurture our students to achieve their best results. We always organize a conference for students to know about their problems, what they want more from us and how we acquire more results by working together. These all things make Power Mind Institute the Best SSC Bank Railway Coaching.